Marvelous Multiagers! : Christmas in July! In my package, I got two books!! I received The Naughty Fairy's Naughty Surprise and Snail's Birthday Wish! I sent One Hundred Hungry Ants to Caitlin. 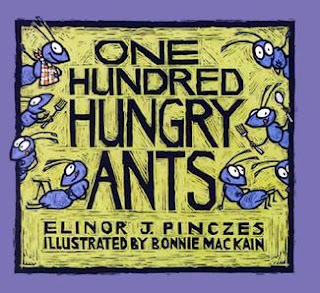 This is also a cute book about ants trying to get to a picnic. On their way, they rearrange themselves to try to find the fastest way to get there! I can definitely see its use for arrays, as the ants describe their 4 rows of 25, or their 10 rows of 10, but for students who aren't ready for arrays, multiplication, or division, I made an activity for Caitlin that asked the students to write a letter to the one hundred hungry ants telling them why they shouldn't come to our picnic! I can't wait to use the activity with my own class and read what the students come up with. I love this book! I've used it for arrays, and will copy your idea about writing the letters.